Cambodian textile workers took to the streets to protest their low wages on 1st May 2013 and some of them were fired by Nike within a month. 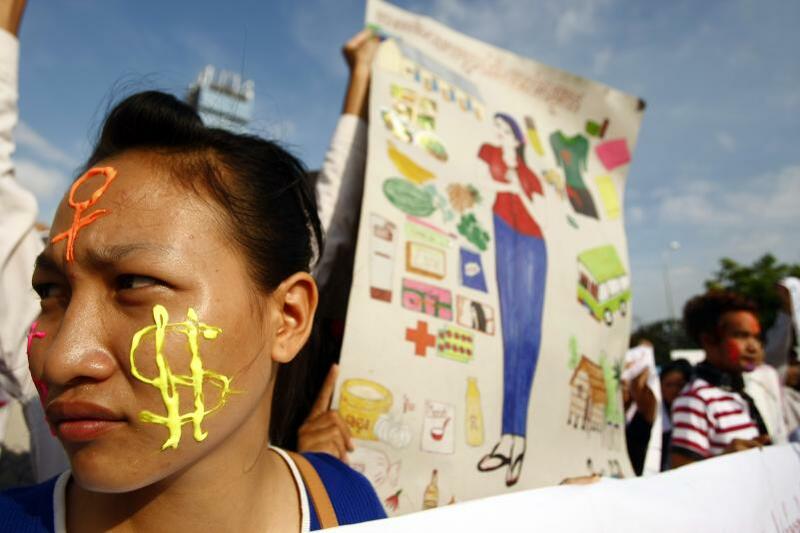 Last month Cambodian textile workers took to the streets for their May Day demonstrations on work, pay and conditions. One of them is seen here holding up a painting of a young woman presumably representing herself and or co-workers. In the top left corner of the painting is what appears to be a clean and safe garment factory (unlike the one that collapsed and killed some of her fellow garment workers two weeks later on 16th May 2013.) Below are paintings of fresh fruit and vegetables and exercise books (perhaps illustrating professional training and education), a red cross for healthcare and some dominoes (suggesting leisure time maybe). Then there are cooked food motifs (rice, dumplings and soup), a traditional home set in some trees, a bus and some clothing items. Protests such as this can often feel remote if they are geographically afar – although empathy is often overwhelming – but the international language of this painting and its eloquent list of textile workers’ needs makes me think of the thousands of textile graduates that leave college this week in this country. Where they will go for work and where will they live? Internships and placements with the fashion houses are always popular but are mostly unpaid – textile graduates can often get work at Alexander McQueen or Matthew Williamson but the remuneration is frequently nil or may be enough to buy some fruit (who is protesting this?). The clean, bright factory to join – a collective space for textile design and making – is an unlikely result since there are just a handful left in London, Lancashire, Yorkshire and Scotland and not enough for 1200 graduates. Once they have moved back to their parents’ home perhaps graduates might apply for an entrepreneurial grant yet the skills to run a longterm business do not always lie with the designer herself since so much to do with successful entrepreneurship is not connected with the quality of creative ideas and dexterous skill. Instead, formulae for success include the connections you have around you already, the external support and experience you have in your familial community (including business, social, legal, technical and cross-cultural support); then there’s the confidence and skills an individual needs to build upon these and insight as to how best to utilise and build upon them, significant capital behind the project to really get the business chugging along, a financier to formulate targets with the individual in a trusted, integrative fashion, resilience as a creative force, personable dexterity and a thorough understanding of multiple income streams. Frequently, a graduate might get a studio somewhere such as Cockpit Arts where they become a sole trader in a solitary space (for the next 10 – 20 years). These are coveted spaces and are limited to the ‘lucky’ few. It usually takes at least two years before a recent graduate acquires one. Once in, do they have in place that much needed familial community (business, social, legal, technical, cross-cultural), the confidence and skills to build upon these and insight as to how best build upon them, the significant capital behind the project to really get the business flowing and the financier to formulate targets with the individual in a trusted, integrative fashion – just a few of the structural, social and emotional elements needed in order to flourish and survive? The sales generated from the sole trader practice may buy a few of the clothes featured in the top right of the painting – especially if made by the Cambodian women featured – but the traditional home set in trees may remain more elusive. The bus will be familiar and maybe one of the exercise books will become prominent when the graduate is awarded a Start-Up scheme that allocates a mentor for a few months. After four years, however, a layer of dust may lie on some of the graduate’s early boxes of stock. At this stage, the symbol of the exercise books will loom large while the graduate thinks of returning to college: to pay not quite as much as the £27000 they paid first time around to give them some hope. At the Slow Textiles Group we don’t believe this model and its repeating cycle is taking the textiles industry anywhere new nor nurturing the talent that is so evident in our graduates; mostly, it trains yet more sole traders who become tutors with limited industry experience. Why does our education system continue to create an ever larger army of sole traders? Why is education fixated on the individual? Does Education represent and imbue the integrative collective while education as business promotes individualism, by their very structures? The Slow Textiles Group exists in order to act as a creative, supportive platform that produces new work, exhibits and sells whilst publishing thoughts, ideas, workshops, collaborative days and books for textile designers to adjoin to, feel solidarity with and share in a relational activity which is what business, in fact, is – all through their lives. There is no on/off mode, emergent artist/arrived/forgotten mode, 3 years only mode or you have permission to experiment because you paid £9,000 mode. We foster confidence and connectivity through collective experience in real life – and our by-product is cultural capital – it’s that simple. Next article#TextilesInspiration#SlowTextilesStudio Resources Library Coming Soon!